Shirley McCay is taking a break from international hockey. The women’s Irish Senior Cup second round is the highlight of the weekend action back home while Ireland’s men reflect on their battling display in going down 2-1 to tournament favourites Australia at the World Cup in India. Pegasus, who are among the fancied teams lift the famous trophy, are among the seven Ulster sides in Cup action. They will be expected to beat Trinity while one local side is guaranteed a quarter final place with Ards hosting Belfast Harlequins. Ballymoney have a tough home tie against Loreto while the other Premier League sides are also up against top-flight opposition with Lurgan and Ulster Elks away to UCD and Railway Union respectively and Banbridge travelling to Cork Harlequins. During the week, Shirley McCay, who is taking a break from international hockey, hit a rare hat-trick as Pegasus opened their Denman Ulster Shield account with a 6-0 win over Queen’s. Ards got their first victory of the season as Brenna McEwan scored the winner in a 3-2 victory at Dungannon while last season’s runners up, Lurgan were comfortable 5-2 winners over Lisnagarvey. Meanwhile, Ireland’s women had mixed fortunes in Valencia in their first games since the World Cup, losing 3-2 in their opening game and 1-0 in the third after drawing the second 2-2 against their Spanish hosts. Gillian Pinder and Nikki Evans were on target in the first game while Pegasus midfielder Ruth Maguire scored her first senior international goal in the drawn game with Lena Tice also on the mark. Also on the international front, Ulster talent coach McCay insists the women’s World Cup has produced a positive legacy but the Pegasus defender says it’s important to continue to build on the momentum. Coinciding with the national team’s magnificent silver medal achievement in London back in August, women from a wide variety of sports have got together to launch a new campaign entitled 20x20. It is designed to fulfil a three-pronged aim, namely to increase media coverage, spectator. numbers and participation levels by 20% by 2020, hence the scheme’s title. McCay, capped 273 times by Ireland, represented hockey at the launch held at Windsor Park, hosted by the NI Female Sports’ Forum. She said: “There has been fantastic support since we came home from London, just to see clubs having waiting lists at youth level and even adults getting back into the game is fantastic and we have been able to go out to schools and clubs and let them be part of it as well. McCay says that while the momentum which followed the World Cup success has filtered down to clubs, it’s important that they do more to promote themselves and the sport in general. “More so than ever before we have given them a success story in the summer but we’re just not representing one or two clubs, we are representing the whole of Ulster and it’s really important that those clubs take advantage of this and really grow from there. “I think at club level we are still falling a wee bit behind in promoting hockey and I don’t know if we get as many people coming to watch the matches as we could. “Whether that’s because of the time of day when everyone else has their own hockey or their own sports to be involved in I’m not sure but stories like the summer can only help and we have a long way to go but we are making strides, ” she added. 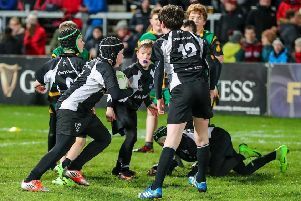 “We played a Sunday game three weeks ago against Loreto and the sideline was lined with kids and adults. On the men’s front on Saturday, Annadale face a long trip to Cork for a rescheduled EYHL game bidding to pull further clear of the drop zone. In IHL 2, there’s a local derby between Kilkeel and Instonians with both teams anxious to get the win to keep on the coat tails of group leaders Corinthian. Kilkeel warmed up by making it six wins from six in the defence of the Ulster Premier title by beating Belfast Harlequins 3-1 at Deramore midweek. Mark Stevenson scored two and Luke Russell was also on target after Michael Patterson gave the Quins the lead. In the other section in IHL 2, Bangor, who were 9-1 Ulster Premier winners over Antrim midweek helped by a Harry Dow hat-trick, will be going out to get something from their game at UCD.